Although not as common as its counterpart signal, the hanging man, the inverted hammer can still be a useful tool – in the right hands. In this addition to my free price action course, I’m going to show you how to start trading the inverted hammer candlestick pattern. This candlestick formation is a weak reversal signal; therefore, it is not wise to take this candlestick signal, alone, as an entry trigger. Although it’s typically not taken as an entry signal on its own, just like the hanging man, the inverted hammer can be great for building a strong case for a reversal trade or early exit. When combined with stronger reversal signals, or a setup that works well with candlestick signals, it can be especially useful. Note: If you’ve been reading this blog for any amount of time, then you probably already know that I don’t recommend pure candlestick trading – especially with the moderate or weak signals. I prefer to combine candlestick trading with a reliable trading system that is profitable on its own. At the very least, you should be taking these signals from significant support and resistance levels. 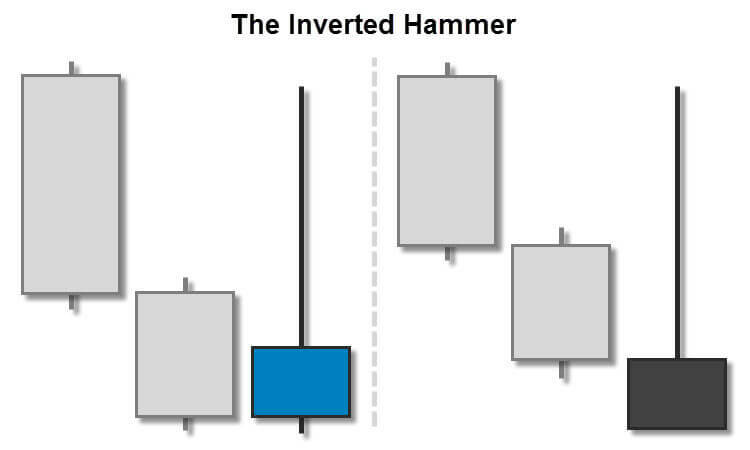 What is an Inverted Hammer Candlestick Pattern? The inverted hammer candlestick pattern is a weak bullish reversal signal. It looks just like a shooting star, only it appears at the bottom of a trend. Like the shooting star, the inverted hammer should have a long upper wick/shadow (at least 2x the size of the real body), and it should have little or no lower wick/shadow. The real body can be either bullish or bearish (as seen in the image above). The inverted hammer candlestick, itself, is considered to be slightly more bullish if the real body is bullish. However, if you use this signal in conjunction with a confirming candle (like I’m going to show you below), it is actually slightly more bullish, in my opinion, when the real body is bearish. That’s because the confirming candle will typically engulf, at least, the real body of the inverted hammer, and it often engulfs more. An inverted hammer formation is only considered to be a true inverted hammer when it appears after a downtrend in price action. As with any of these reversal signals, it’s important to take them in the correct context. Never trade these candlestick signals from consolidating price action (flat or sideways markets). The psychology behind this signal is that the bulls were buying during this time period, but were unable to hold that buying pressure. That being said, the bulls have shown an ability to move price up from the current level. This could make the bears nervous enough to start taking profits at this level. 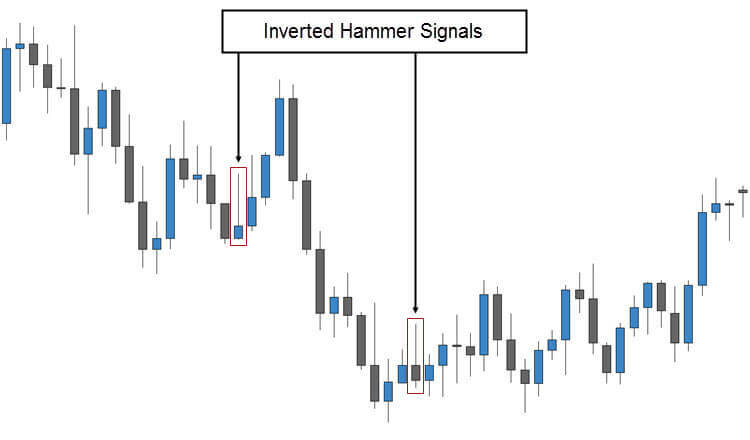 In the image below, you will see a couple of inverted hammer candlestick patterns. The length of the lower wick in the second example is on the limit of what I would consider acceptable. Any lower and this candlestick would be considered a high wave candlestick (indecisive). In both cases, these formations signaled a support zone. Even in the second example, price eventually went up from that zone significantly (although I had to cut the bullish price action off to center the image). You might also notice, in the second example, that there was a high wave candle before our inverted hammer, and a long-tailed doji afterward. These are also signals that a support zone has been hit. Either example (from the image above) could have been used as an early exit signal for a bearish trade that you were in, which is how this particular candlestick signal is usually used. Example: You enter a bearish trade, and price action has been on your side so far, surging lower. You see the first inverted hammer, and you decide to close half of your position, locking in some profits. You’re thankful that you kept some of your position in the market, because price has continued lower. Upon seeing the second inverted hammer, as well as some other bullish signals (or signals of indecision), you decide to close your remaining trade. 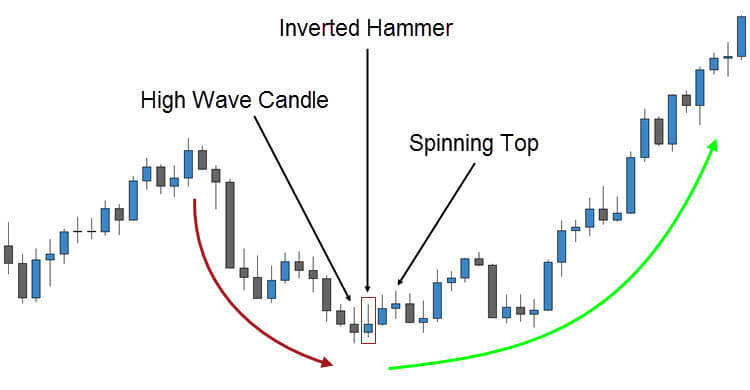 In the image above, you can see another great example of how trading the inverted hammer candlestick signal can help you keep more of your profits. The high to the left of our inverted hammer was capped off by a dark cloud cover candlestick pattern. Let’s assume you entered a sell order at that point, and you’re waiting for an opposing, bullish signal to close your position. After the initial, strong, downward move, there was a bullish piercing pattern. However, in this case it was not very bullish, because of the relatively long upper wicks on both candles in the pattern. Let’s assume you didn’t close your position there. Next, you get a high wave candlestick, then our inverted hammer, followed by a couple of spinning tops – one of which is part of a bullish harami. If you would have closed your position when the inverted hammer formed, or shortly afterward, you would have locked in about as much profit as you could have possibly expected from that trade. I mentioned earlier that I do not recommend trading the inverted hammer candlestick pattern as an entry trigger. If you choose to trade it as an entry signal, the technique above is the correct way to do it. When trading this signal as an entry trigger, you need to wait for a bullish confirming candlestick. In the example above, the candlestick after the inverted hammer closed above it, but it has a long upper shadow (which is bearish). You would need to wait for a bullish candle that closes near the top of its range for a proper bullish confirmation. A good rule of thumb is to wait for a candle that closes within the upper 1/3rd of its range (for a bullish confirmation). In our example, we got a proper bullish confirmation on the very next candlestick. 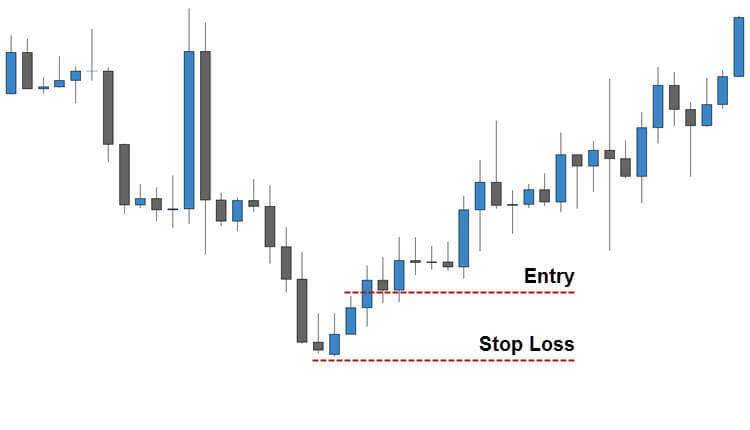 In the example above, I added dashed lines to show you the proper placement of your entry level and stop loss. The entry should be 1 pip above the high of the confirmation candle (as shown above), or at the open of the candle immediately after the confirmation candle closes, depending on your trading strategy. The stop loss would be placed 1 pip below the lowest low in the area of the inverted hammer signal – not necessarily the inverted hammer itself. Japanese candlesticks are a great way to predict short term market directions, but there is never a guarantee on how long any particular reversal or continuation pattern will last – especially with the weak signals. Combining price action trading with a profitable trading method can help you qualify better trades and improve your strike rate. Context is so important when trading any candlestick signal. Remember: A true inverted hammer only occurs after a downtrend in price action. Never take this signal from a consolidating market (flat or sideways price action). Trading the inverted hammer candlestick pattern can be a powerful tool, if done the right way. You should always and demo trade any new trading setup that you plan to add to your repertoire, and use responsible money management when you decide to go live. Good luck and happy trading!